At sea, a line of surfers straddle wild, white-topped waves. Back on the stately Quai de la Grande Plage, wetsuit-clad surf-bums stroll alongside ladies with lapdogs. It is time for that great French unifying ritual: lunch. I’m in the grand old resort of Biarritz, expecting to find the pomp and stuffiness of retired nobility. Instead, I discover France’s top surfer hangout, and a beguiling mix of the regal and the raffish. In prime position on the south-western French Atlantic coast, on the Côte Basque, the town forms the apex of one of the best-loved stretches of French seaside. Long beaches, buffeted by the Bay of Biscay’s winds, lead all the way to the Spanish border. Biarritz still boasts the stately old buildings that attracted luminaries including Queen Victoria and Napoleon III in the late 19th century. By the 1970s, it had become a little too stuck in the past. Now, the town is France’s comeback kid, fashionable with the natives as well as foreign hipsters. “The surfing has really bought the energy back,” a local hotelier told me. 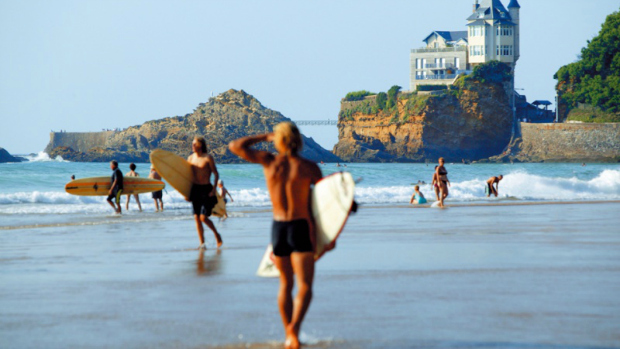 Companies such as Ripcurl and Billabong now have their national headquarters in Biarritz. It’s home from home for Karl Lagerfeld and chef Alain Ducasse, and currently to Londoner Wilma Johnson, 54, artist and author of her memoir, Surf Mama. 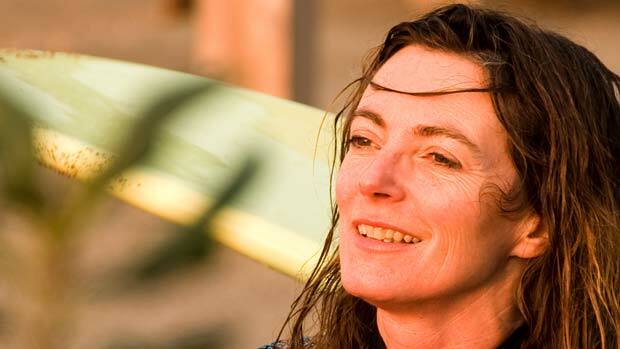 Wilma took up surfing at 40, after a move to the region and a split marriage. With Johanna, a Swedish friend, she set up the Mamas Surf Club for women (their motto: “Out of the kitchen and into the surf”) and her life fell into place. “Once I learned to surf, none of the rest of it seemed to matter any more,” she says. “It wasn’t just the need for the adrenaline rush. I felt as if I had to get off the land for a while, to see the world from a different angle,” and attempting to perch atop these rolling waves will certainly give you that. “When you’re out in the surf, your problems tend to dissolve into the foam,” says Wilma. Wilma showed me Guéthary, the prime surf village south of Biarritz, where the breaks are at their most magnificent. I gazed at the sea galloping in, then explored the leisurely resort behind, a scene replete with well-heeled maisons secondaires, many of them the fashionable Basquaise houses with eyebrow gables and ox-blood beams that look for all the world like a splash of Surrey en France. After watching a furious game of pelota in the centre – think Basque squash with added machismo – I went for a beer before heading back to Biarritz for lobster and muscadet. That afternoon, I headed into the hills and strolled through wildflower-strewn Alpine pastures, where the only sounds were tinkling cowbells and the distant roar of the sea. It was tempting to try the famous Atlantic-to-Mediterranean GR10 walk, but I’d leave that for another day as I’d been told by Wilma that St-Jean-de-Luz, close to the Spanish border, was the kind of heaven-sent, easygoing French town that makes you start looking involuntarily in local estate agents’ windows. I drove in, found a café on the wide bay, and watched couples pad down to the beach in white toweling dressing gowns. St-Jean’s seafront Helianthal Hotel is a thalassotherapy spa and, in the early evening, the beach turns into a living brochure photograph. For a couple of days I swam, ate seafood, enjoyed the surf and remembered Wilma saying: “This could be the California of Europe”. She’s right, you know. Chatting with Oliver Bennett about my life in ‘the new California’….